Here is a list of best free BAT to EXE converter software for Windows. These software let you convert BAT files to EXE or directly convert Batch script to EXE. While compiling EXE, these software also let you add icon, version details, visibility options, and security settings. Include other files in EXE package. Create EXE with 32 Bit or 64 Bit architecture. Create Batch file script from scratch to create EXE file. In the following list of free BAT to EXE software, you will find options for both novice and advanced user. So, go through the article and pick the one that suits you the most. Bat To Exe Converter is the one that I like the most. It is free to use and is the most feature rich software for this task. It lets you configure various settings for output EXE file, add icon, add version details, include files in EXE package, and even lets you edit Batch script before conversion. You can also checkout these best free solutions for Software Deployment, DLL Injection, and EXE to BAT conversion. Bat To Exe Converter provides a bit of advanced approach for converting BAT to EXE. Although, you can convert only a single file at a time, you get a bunch of configurable options for conversion. You can set certain conversion parameters, include files in the EXE package, add version information, add icon, and more. The options in the first tab let you set visibility, working directory, encryption, architecture (32 Bit or 64 Bit), etc. for the converted EXE file. If you want to include certain files with the EXE as a package, you can add them in the second tab. You can add version information, as well as EXE icon in the 3rd tab (optional). The fourth tab is Editor tab, where you can add certain commands. 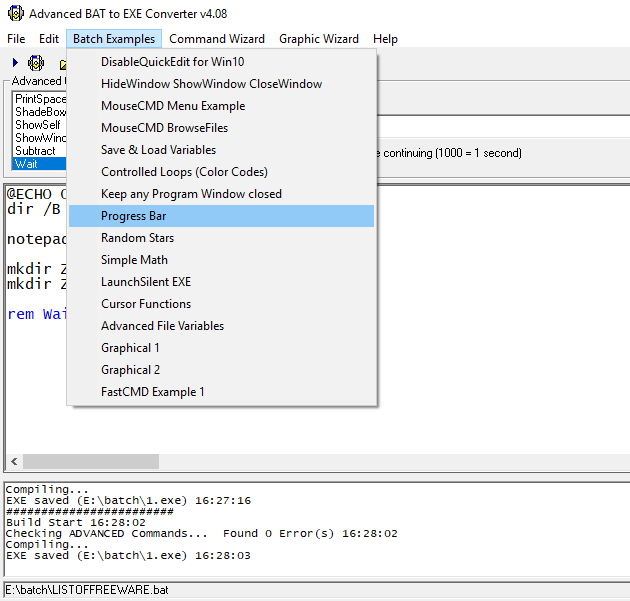 When all set, clicking on Compile option begins the conversion and saves output as EXE. Bat To Exe is a simple and one of the best free software to convert BAT files to EXE. No advanced options; all you need to do is add a BAT file as input, specify the output EXE filename and a folder to save it. Once done, as soon as you click Generate option, the EXE file will be generated. It is an open source bat to exe converter and simply lets you convert one batch file to executable file at a time. Advanced BAT to EXE Converter is another software to convert batch to exe for advanced users. It has a compiler based exe builder, which lets you add various inbuilt batch commands to existing or new BAT files. Do note that the free version is only available for non-commercial purposes. You can either compile a batch script from scratch, or add an existing BAT file to convert it to EXE. If you want to convert a BAT file as it is, you can simply add a BAT file and build respective EXE. If you want to modify a BAT file or compile a BAT script from scratch, you can use the Command Wizard offered by this software. It helps you to quickly add predefined batch commands to BAT script. A Graphic wizard is also available. This bat to exe converter software is mainly built for advanced users who have knowledge of batch scripts. One can also use it to simply convert a BAT file to EXE without any modification. Slimm Bat to Exe is an amazing batch to EXE converter. It lets you create EXE file from BAT file, and also lets you add an icon of your choice to the EXE file. You can normally create an EXE, create a window less EXE, or create custom EXE by editing batch script before conversion. Because of the options it provides, Slimm Bat to Exe can be used by basic, as well as advanced users. Express: It lets you instantly convert a BAT file to EXE. You can also add an ICO file with the same name as the BAT file to add it as an icon on EXE file. Windowless Express: Convert a BAT file to windowless EXE. You can click an icon for the EXE file here as well. Custom: Load and edit a bat file before converting it to EXE. Icon can be added. It is one of the best and straightforward software available out there for BAT to EXE conversion. Bat To Exe by BlackHost is another good and intuitive Bat to Exe converter software for Windows. It allows you to convert a BAT file to EXE instantly. You can even edit a batch script or write a new batch script to get the corresponding EXE file. Option to add an icon to EXE is an added advantage. It has a very small interface, but the options are placed very neatly. Add a BAT file, and you will be able to view the respective batch script in the text box on the interface. You can either convert it directly, or click on the From the textbox option to edit script. It is another free bat to exe converter for basic and advanced users. Batch Compiler is an advanced tool which can be used to convert BAT to EXE. You can either load a BAT file, or write a batch script and convert it to EXE. It provides various tools that can be helpful to advanced users. For quick BAT to EXE conversion, load a BAT file, and go to the Quick Compile section at the bottom right section of the interface. Here, you can add an icon, set visibility, set version info, and compile the loaded BAT as EXE. To build or edit a Batch script, you can work in multiple tabs. To help you out, several inbuilt commands, examples, and graphic wizard is available. You will also find several editing tools to copy, cut, paste, find, zoom, etc. Note: The free licence of this software only allows you to use the compiled EXE on the same computer. If you want to distribute the EXE to another PC, either for personal or commercial purpose, you will have to buy the respective license.